. : DARPA: Superior AI :. The goal of the project is to substantially advance the state of the art in artificial intelligence and, as a major necessity of achieving this goal, increase our understanding of the mechanisms that underlie biological intelligence. We will avoid methods and systems that may appear intelligent, but are, in fact, hard coded and not intelligent. Many current systems give the appearance of intelligence, however, these systems cannot adapt to changing circumstances or truly interpret and make decisions based on input. Systems that can do these things represent the future of computer technology. This work builds energy aware neurocomputers to solve problems that cannot be addressed by today's AI technology. Successful completion of this work allows going beyond the state-of-the-art AI, which is represented by Deep Learning (DL). In the overall problem setting of DL, resource constraints are often ignored, or have just a secondary role. DL typically requires huge amount of data/ time/ parameters/ energy/ computational power, which are not readily available in various scenarios. Target applications include rapid response to emergency situations based on incomplete and disparate information, supporting graceful degradation in the case of physical damage or resource constraints, and real time speech recognition in noisy and cluttered background. The project provides an approach to machine learning using brain-inspired spiking neural networks (SNNs). In Phase 2 we develop a unified software platform BindsNET, which is capable of pattern recognition on images and videos using unsupervised learning techniques such as spike-time dependent plasticity (STDP) and self-organizing maps (SOMs). For details of phase 2 see this link. How to use energy aware CAN units to implement encoding and recall of information in the sequence of oscillatory activation patterns? How to incorporate the developed CAN units exhibiting sequential information encoding and recall as components of practically relevant and competitive Machine Learning methods? Key achievements accomplished during Phase 2 (year 2) serve as the basis for the work in the upcoming Option 2, Phase 3 (year 3). Our Phase 2 project had 4 tasks: (1) CAN models for energy aware computing; (2) biologically inspired efficient learning algorithms; (3) architectures supporting energy aware computing; (4) hardware implementation of energy aware computing. As we move ahead, the main thrust is to expand on the CAN model and CAN arrays developed in the past Task 1 to create dynamic memory devices. At the same time, we consolidate the result achieved in past Tasks 2 &3 regarding learning and architectures, respectively, to directly support CAN-based memories. As we move to the next phase, the previous Task 4 on hardware implementations is being eliminated, allowing more efficient use of the available resources, and better focus on elaborating and implementing the novel concept of CAN-based dynamical memories. 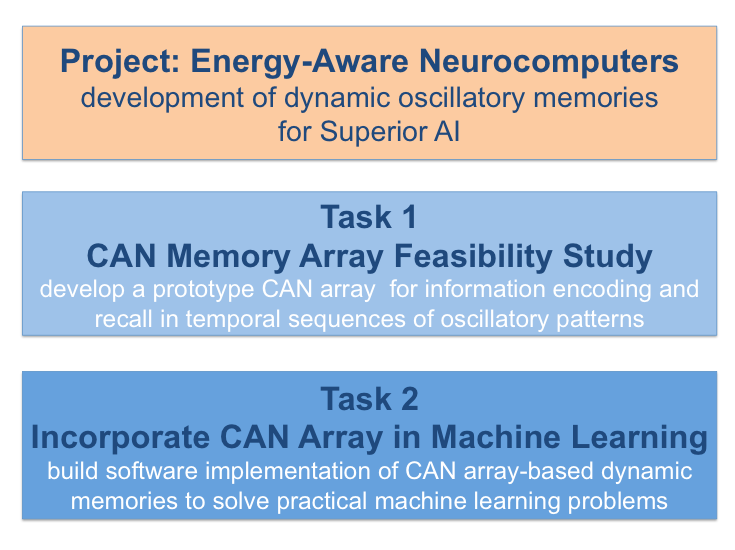 Task 1 aims at developing a prototype CAN array memory for energy aware computing. Energy efficiency is a fundamental requirement to achieve superior AI beyond the state-of-art. We develop superior AI in which energy constraint leads to intelligence. Specifically, CAN arrays produce a time sequence of oscillatory patterns, and these oscillatory patterns are the basic components of the CAN array as a dynamical memory device. We develop mechanism of control these oscillations, and employ learning tools to encode and recall information in the oscillatory sequences. Task 2 builds software implementations of the CAN array-based dynamical memories to solve practically relevant machine learning problems. We select applications to show the advantages of the CAN oscillatory memory array approach, especially in time series prediction, and in problems involving dynamic changes, often unexpected or unknown. In addition to our ongoing implementations on AI Gym computer gaming, like Atari breakout, we use some benchmark tasks from Numenta commercial applications, including geo-spatial anomaly detection. We develop quantitative measures in term of resource allocation, computational resources to achieve a gives performance level, to demonstrate competitive edge of our CAN-based solutions.